PICASSO"S daughters, Limerick of Pines Edge was named the 2019, AOA SUPREME CHAMPION, Dark Suri Female and GLR Sloan, Halo Ranch, was named the 2018, AOA SUPREME CHAMPION, Dark female Suri. That's two in a row for Picasso! GLR Sloan is another prime example of Picasso passing along his great traits. Her full sister, GLR Sombria, rocked the show circuit in 2016 collecting 4 banners in only 4 shows! We expect great things from this little gal and can't wait to see how she measures up! 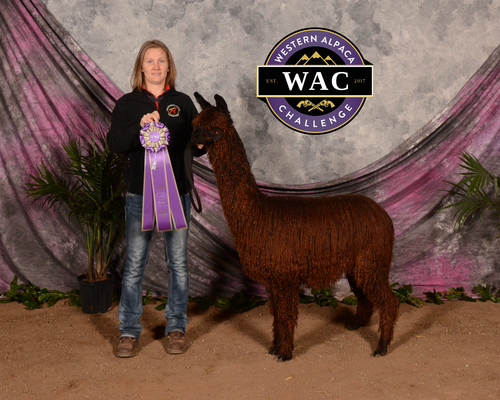 Sloan was awarded the Reserve Champion at the 2017 AOA National Show! 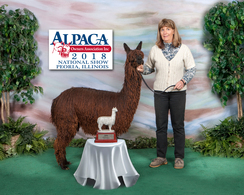 Sloan's 2018 show season, AOA Nationals Color Champion and Dark Supreme Champion Female.